A luxury sedan requires a big-beefy V-8, right? Wrong, the 338-horsepower GS 450h has replaced the V-8-powered, 342-hp GS 460 and the 340-hp GS 450h and offers better gas mileage as well as massively improved handling. The GS 450h gets a second-gen version of the Lexus Hybrid Drive. The gas portion of the power-split hybrid system is a 286 hp, 3.5-liter V-6 that operates on the Atkinson cycle and has an upgraded D-4S direct/port injection system. A 200-hp motor handles regenerative braking and movement and a 180-hp motor acts as the generator, engine starter and speed controller on the electric side. A continously variable transmission is accountable for keeping the 2013 GS hybrid moving whether it is on electric, gas or a blend of the two. All that efficiency combined allows the 2013 GS 450h to get 29 mpg in the city and 34 mpg highway. The Lexus Hybrid Drive system CVT though somewhat uninspiring in the twisties even with paddle shifters, works quite well in normal driving situations. The GS hybrid offers several driving modes including; Eco, Normal, Sport, and Sport+ settings on the Drive Mode knob as well as separate Snow and EV buttons. In EV mode, the car can coast at up to 40 mph on the electric motor alone and in Snow mode the throttle action is dulled significantly to help in icy conditions. As a luxury sedan we would expect the GS 450h should accelerate flawlessly, and it does making the run from 0-60 mph in 6.0 seconds and completing the quarter mile in 14.6 seconds. To accelerate so brutishly, of course, kind of defeats the purpose as the cars six-cylinders are forced to 6000 rpm for peak horsepower as the car’s CVT wails away and gas mileage plumets, never-the-less if you have to the car will go. With the Drive Mode selector in Sport+ the car engages Adaptive Variable Suspension (shock dampening), tightens the steering, and sharpens throttle response and the car despite its heft is surprisingly well-mannered. Simply put, it does not feel heavy in the twisties. The roadholding capabilities feel rather un-Lexus-like and that is thanks to some very nice enhancements like wider tracks, a 14% stiffer body, an all-new double A-arm front and multi-link rear suspension and traction management electronic. Improving handling often degrades ride quality, not so with the GS 450h. The GS hybrid easily soaks up the road and road and wind noise are minimal. Even the Sport+ mode is comfortable enough that it could be used for everyday driving. The GS hybrid’s Luxury Package is magnificent and the first thing you notice when you sit behind the wheel are the 18-way power front seats, they are fantastic. It is immediately clear that a very high level of importance was placed on improving occupant comfort and it shows. Throw the car in Sport+ and adjust the side bolsters for improved torso containment and you have a truly fantastic ride in the foothills. Put it in Eco and relax the bolsters and you are riding in comfort and ease to the office. The car offers luxury and comfort in every setting. Another notable feature inside the cabin the matte bamboo trim. Bamboo, likely chosen to appeal to greenies, has an awesome texture and the matte finish really adds to the interior. It looks much fresher than your standard glossy dark wood interior and it actually feels like wood seeing as it isn’t covered in a quarter inch of lacquer. Along with luxury comes a pretty heavy helping of technology, all surrounding the giant multimedia screen dead center in the dash. The 12.3-inch display is included with the optional navigation system and is recessed within the dashboard nicely and features a very well-implemented and user-friendly interface. The controller for the screen is a joystick type pad that moves a pointer and uses haptic feedback to identify active areas on the screen. It is the same system used in the CT200h I reviewed recently and it is a system I have grown quite fond of. Voice command works well if you prefer it to physical controllers. You can place calls by contact name via a Bluetooth-paired phone and you can play music by artist or album name as well. Via an Enform app on my iPhone I could use in-dash apps including OpenTable, Yelp and Bing search. My car included the Mark Levinson audio option, which boasts an impressive 17 speakers and 835 watts. The system utilizes Harman International’s GreenEdge speakers which are designed to produce quality sound with less power. Sound quality from the system was outstanding. The 2013 Lexus GS 450h is an eye-opening view into the future of luxury proving that when used correctly fuel economy, technology and luxury can work in harmony. A luxury sedan that gets 30 mpg but will still do 0-60 mph in 6 seconds. Not bad. My GS 450h started at $58,950 and after adding the Luxury package, blind spot monitor, Mark Levinson premium audio, navigation and a parking assist system the final rolling price was $69,754. 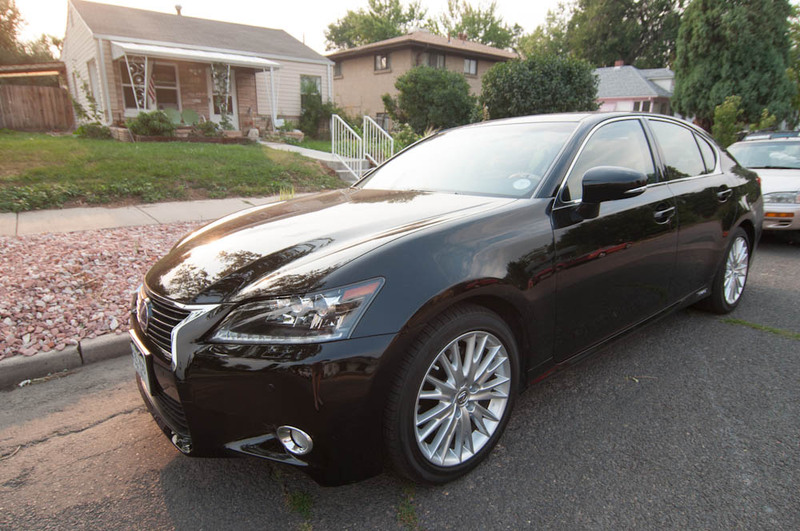 The 2013 Lexus GS 450h is a technology power house, offering fantastic fuel economy for its class with its hybrid drive system all while giving drivers the convenience, luxury and comfort they have come to expect.